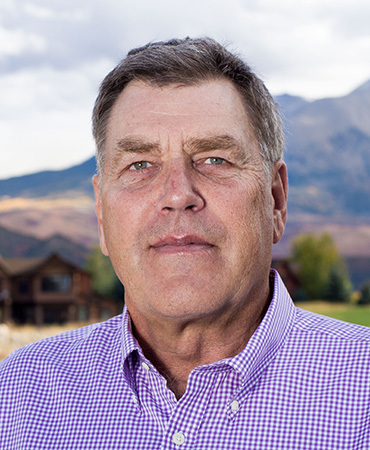 Founded in the summer of 1999, Olde Towne has grown one move at a time to become the Roaring Fork Valley's largest moving and storage company. We occupy over 50,000 square feet of heated, secure and video-monitored warehouse space located on Highway 82 between Glenwood Springs and Carbondale. Exceeding your expectations is the standard by which we operate. Whether moving your sofa across the street or your entire household across the world, our uniformed and highly-trained crews will carefully attend to ALL your packing, moving and storage needs. All our employees are full-time members of our team and many have been with us for years. Look What's Happening At Olde Towne! "Over the past few weeks, the Historical Society has been moving back in–setting up offices and the new community gallery space. Things got really exciting this week when our friends at Olde Towne Moving & Storage brought all the artifacts, maps, documents, photos and archival material back from temporary storage. Do you have any idea how much muscle it takes to move more than a century? The guys at Olde Towne really came through." Thank you so much for your generous financial contribution to our 2016 Walk For Hope. Our gathering on Saturday, September 17th was a beautiful day filled with support and hope for families affected by pregnancy and early infant loss. Olde Towne's financial contribution helped us tremendously as we hosted our biggest event to date. Although it is bittersweet to see our event grow, it is paramount for One Moment to be able to continue to offer support to these hurting families in our valley and beyond. Thank you for coming alongside us in our mission to serve these families. It means more than we can express! Thank you so much for the generous gift certificate at Allegria, our Cdale favorite and for the bottle of C.S. We were glad to be able to open our home to you all. You have a great operation, very professional & nice. It was nice to meet you! Thank you for working with us to relocate the desk taken to our home at Meeker back to Aspen along with other items. We appreciate your willingness to assist us and the efforts of your team to make sure the items were returned to the correct home. Once again, we would like to acknowledge the courteous and considerate customer service of you and all the team at Olde Towne. Thank you for supporting the 2016 Grizzly Hockey Gold tournament! Your contribution helps us provide hockey to over 180 kids in the valley. Please let the crew know how much we appreciate all their hard work, patience and sense of humor with our move. They were fantastic. This was the third move (and hopefully the last for a long time) that you guys have done for us and I would be happy to provide a reference for your company at any time! We are so pleased with you guys, you have no idea! The board is extremely happy. We recognize the extra effort put in by all of your team and appreciate not only the extra hours, but the incredibly positive attitude presented! You should be very proud of your staff. Thank you and congratulations!!! Olde Towne Moving & Storage has been selected as co-winner of Habitat's "2009 Business Partner of the Year" because of your incredible contribution to our increased success in building homes. It was an honor when Olde Towne accepted our request two years ago to be "The Official Movers of Habitat for Humanity" here in the Roaring Fork Valley. 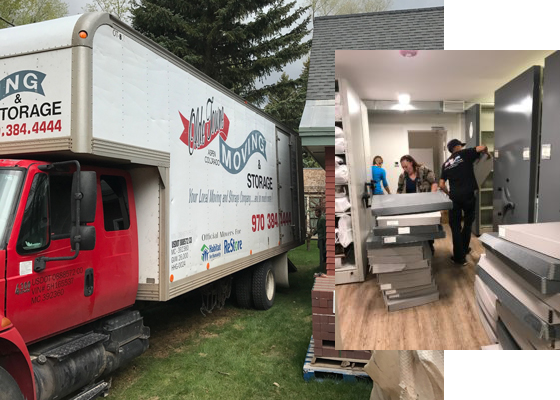 Your help this year has far exceeded our wildest expectations, culminating with the amazing "all hands and all seven trucks on deck" three-day effort to salvage 3,500 items from Aspen Skiing Company's Little Nell Hotel remodel. Thank you for all of your help with moving our donors' furniture, appliances and assorted other home furnishings and building materials. Not only do your crews do a wonderful job with moving things flawlessly and promptly....you are making an enormous contribution to our building fund in the valley by moving things for free. We estimate that your team will be saving us approximately $75,000 each year. I never write reviews of companies but in this case I decided to take the time. I research every company I do business with, especially when it comes to moving. In this case I even called an attorney that specializes in transportation issues including moving scams. After he reviewed their website and credentials, he told me he would let Olde Towne move his mother. Olde Towne DID absolutely everything they said they would, They were as good (and better) than the national moving companies I've used in the past. Do yourself a favor....if you're going to move, save yourself aggravation and use Olde Towne. We had a wonderful experience with your company. If we do another project in Aspen, we'll definitely call you! Tony and his crew delivered our belongings from New Castle to Denver yesterday and I wanted to say that they did an excellent job! Especially the man who packed everything in the storage units. I didnt think it would all fit, but he got it done. All 4 men were very polite, attentive, helpful. They all worked hard - no messing around or obvious cell phone use. I am VERY pleased with the job they did. Thanks! With greatest appreciation we wanted to thank you for your efforts, time, and consideration while we worked together in preparation of the new Poss Carbondale Office. As this was a personal project for us, we would truly like to say "Thank You" for your team work and delivery services. We look forward to working with you again on future projects! My name is Christi Harris, and last week I moved from Carbondale to Grand Junction. I just wanted to let you know that your team of movers was amazing, and the move couldn't have been better. Tony Mendoza headed up the team, and I can never say enough about him. He is so kind and polite, and so professional and capable. No matter what came up, he handled it easily and effectively, and always with a smile. He truly must be one of the stars of your organization. He is wonderful. His brother Jose, and Rylan and Alfredo completed the team, and each were wonderful. Jose was especially helpful, and always willing to go the extra step to make sure things were perfect. He is surely another of your stars. Jay, thank you for running such a fine organization and employing such professional, capable, kind men and women. Everyone from Matt, to Sandi, to the A-team - all could not have been nicer or more helpful. You guys are amazing. Your people are the best people I have EVER dealt with in the moving business. Last week you came into our house in Edwards, packed it up, loaded some of it up and it arrived today in Tucson. The driver was so incredibly friendly (and strong...he lifted a couch BY HIMSELF)! Gary did a wonderful job making a sense of the costs. Tiana is so helpful in solving matters...they never became a "problem". And her cheerfulness just made me feel good! I have stuff stored in your warehouse and you will be bringing it to me at the end of May or beginning of June. I look forward to welcoming the Olde Towne driver on to my farm in Minnesota. Thank you Thank you Thank you. Please use me as a reference! Eric and Jay, Just a note to thank you for all the work you did to set up and make sure our move of stuff from Cody Wyo to Glenwood happened. We know it was a short time frame. Also, you should both know how professional and efficient your men, Dave Yates and Charles(I hope I am remembering his name correctly) were on the move. They constantly kept in touch as they drove both ways, worked with us as we decided what exactly needed to go or stay, going to Laramie and getting our son's stuff, as well as getting everything into the correct spot in Glenwood. They were both extraordinary professional, efficient, and aimed to please. They indeed were great representatives of your company. Please feel free to use us as references if it would be of value. Dear Eric, Rob & Gabe, Thank you so much for your work on the Snowmass Club project. You guys did an amazing job and we really appreciate your extra hours and most of all your incredibly positive attitudes! We loving working with you and look forward to future projects together. FYI, the bed arrived in perfect condition. The guys were terrific and got everything set up for me. You had said they'd be there between 1 and 3 and they got there at 12:55. Thank you so much. Your service is outstanding. Guys were courteous and sweet. They have moved several times and it’s the first crew that was putting the owners needs above all else. They fell in love with all 4 guys and will call for the same crew when they begin to remodel the basement. She was very pleased with everything. Thanks so much to Olde Towne Moving & Storage for sponsoring our race for the cure this summer. It was a fantastic event with over 1,300 participants which - in the current economic climate -is both remarkable and hopeful. We could not have achieved this success without your help, and we look forward to working together again next year. We/you did it. I am home ready for work and Charlie unloaded the truck. Pretty amazing both of you. All I know is that I can take that off my list thanks to you. Thanks for all you did, hanging in and getting the job done. Charlie is pretty amazing as well. Thought he might have a heart attack with the couch but he left ready for the next adventure. I have been telling people what you did to get the job done!!! Everything went very well, the crew was terrific & we truly appreciated their hard work & efficiency. Todd & I will recommend your company in the future to anyone we know that needs your services. I want to thank you so much for sending the A-Team to move me! It just could not have gone any better, and they were truly amazing. Tony just couldn't have done any more - he is a true professional and went the extra mile to make everything perfect. You should be really proud of your guys - they were all so great. Tony is such a great leader, and I just can't say enough about the amazing job he did. Gary, thank you again. You guys are truly the best. Carol and I want to thank you for your professionalism, hard work and great disposition during the move from our home. Great job and well done. Please distribute this among all who participated. The move went great. Your guys are terrific and have a great attitude. I will have some packing and wardrobe boxes to return to you in a few days. I just wanted to follow up and thank you for all of Olde Towne Moving and Storage’s help. I was truly impressed with the professionalism and care of everyone I had the pleasure of working with. You guys have a wonderful team and I would recommend your services to anyone ever needing to move whether its across town or cross country. All of the pieces arrived very promptly and in perfect condition. Your packing, crating and loading team in Aspen was just as professional and efficient as the team led by Justin when they delivered everything in San Diego. I look forward to using your services again soon and hopefully meeting up in Aspen in the near future. Excellent job by your team at Sharer! Many thanks for your assistance and great service. Just wanted to shoot you a quick note to thank you for all your help in getting my Mom moved. Your crew was polite and professional, and a pleasure to work with. Your history with my parents and your support during a very difficult time was a huge help in getting us through the process. Mom is very happy in her new home and continuing to move in a positive direction with her life. OMG - Chico and his crew were absolutely the BEST to work with. So efficient and organized and most of all - just nice and courteous people! We had the best experience moving in the house. You should be so proud of the crew you have working there. My friend from North Carolina that owns Lee Industries worked all day with them too and said she has never worked with such a great crew! It was great. Thanks again for a great experience. It's a hard job to move into a house and all of you made it easy! Jay, I don't know if you realize how much moving we have done over our 47 years of marriage (28 times!) but let me say that you have done many of them for us. Both Phil and I have been so pleased with your attention to detail and careful work. We consider many of your employees friends, and look forward to seeing them every time we get more ideas about a project that requires Olde Towne's expertise. Will you please relay to them our thanks for all of their good work? On 8/28 we moved Peter Kyle from Eagle to Edwards. He was so impressed with the guys that were on the crew that he would like to get them gift certificates to a restaurant. He has also recommended OTMS to his local board of Realtors as a local mover for their clients! He was also pleased with Gary and his understanding that there were so many unknowns in their move at the time of the estimate and they still came in under what was estimated which they were thrilled about. Hi Anna, you guys did an awesome job. The guys were very professional and courteous. We will definitely be recommending your company to anyone that needs a good moving company. Thank you and your team for making our moving experience seamless. I feel the need to give you some feedback on JD who was (what I thought) the head of your team in our move. Not only was he professional, but went above board to make sure the communication was crystal clear. JD came across several envelopes of money in a drawer that were our children's summer earnings. He came and found me to hand to me personally. Now, yes, we do live in a world where there is no crime and everyone is honest, but…... It wasn't just that he handed it to me instead of the envelopes "just missing" in the move, or "partially found" in a year or so……etc…..i'm sure you've seen it all. It was how he handled himself. How he brought it to my attention and the manner of which he spoke to me. I was beyond impressed with his demeanor, acumen and the multiple conversations I had with JD. Very professional. I would have him lead a move or team at any time. Anna, The office move went extremely well. The moving team was very professional. They were also hard working and very efficient. They understood how to pack and move. We sure appreciated how quickly you were able to respond to our request and then meet our schedule. The one item I saw is that we could have used maybe one more person and we could have finished in the 6 hours. But it wasn’t a problem and everything got moved out. I am very pleased with your service and if we ever need movers again, we will give you a call. We recently moved and used Olde Towne Moving. We couldn't have been more pleased with the great service we received. Your men were polite and efficient and did a wonderful job ~ packing up and unloading. We'd highly recommend Tony and his crew! Thank you. Want to discuss your move or new project?